JACKET H&M Studio collection (similar ones here). SHIRT H&M (similar one here). EARRING Sophie Bille Brahe (similar one here). BAG Kurt Geiger. JEANS Frame (here). BOOTS Jimmy Choo. GOLD RINGS Monica Vinader. This entry was posted in Outfit and tagged Jimmy Choo by Carolina Engman. Bookmark the permalink. Chic and elegant. Loving how femenine looks this masculine outfit in you. Perfect as usual! so classy! those boots are fabulous & i love the colour of your clutch. So sleek and sophisticated yet you still managed to keep an edge! Lovely! Stunning and very chic! I love your strong blazer and your boots are perfection! Such a sophisticated look, love it! so classic and chic with the black and white! Love this classy and classic look! That jacket is gorgeous and I love how you accessorize! Love this black and white ensemble! Gorj jacket and its collar detail. You looking super chic! Such a great pair of shoes!!! Nice outfit! I like the purse and the boots! Very elegant and classy! I love the boots. Beautiful cut! You look great! Love this look, you’re so beautiful! So classy and so chic! Black/ White and Casaul/ Business outfit, nice!! Great look, love the shoes and the bag! This outfit is just so so chic, you look incredible! I love it! amazing outfit, love the contrast between the black and white! You look great with the androgynous style!! You look so gorgeous and chic it’s incredible !! The whole outfit is spectacular, and you makeup is beyond perfect ! You look great! 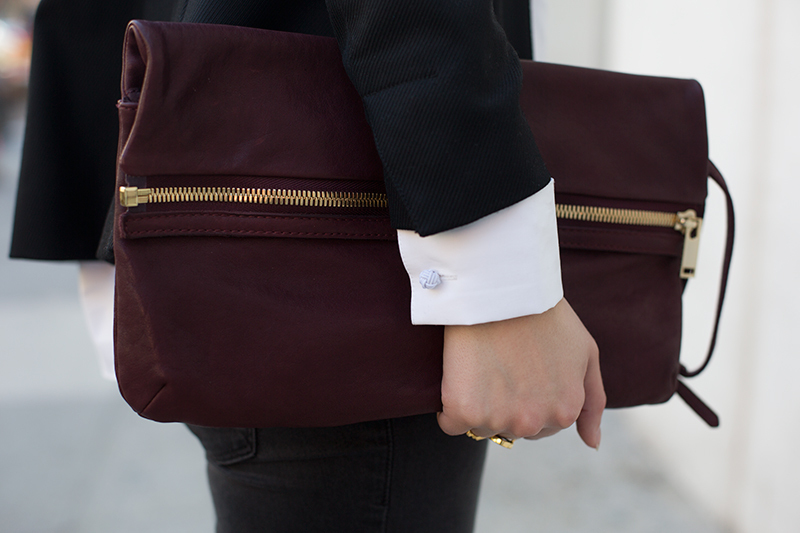 And I love the burgundy detail. Somehow I totally missed the H&M Studio collection. Too bad, because that blazer looks awesome. I saw that jacket and I’m now kicking myself for not buying it! Lovely shoes! Love this jacket and the pants! You look stunning – love the bag! This blazer is amazing. Love the velvet collar! you can’t go wrong with a classic black blazer and white shirt. Very chic! This outfit has some sort of a standard touch with the white shirt, the dark trousers and the blazer, but the bag and the shoes give the whole outfit something special! Great pictures as well! Very classy as always, love it! Lovely selection and great photos! Fantastic blazer! I love menswear too. This look is flawless.